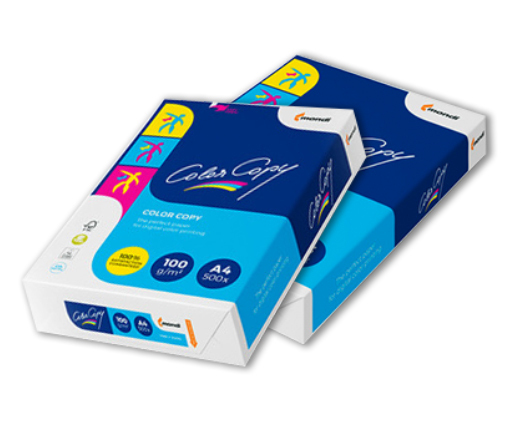 Color Copy - the No1 laser copier paper. Color Copy is the original colour laser paper. It is specifically designed to meet the needs of digital colour laser printing and guarantees true to life, brilliant, colour copies and perfect print results every time. Dive into the unique world of vibrant colours that only Color Copy can provide. Experience brilliant colour reproduction page after page with Color Copy - and be inspired, too! Color Copy is naturally part of Mondi’s Green Range and impresses with its sustainability credentials: CO2 neutral, FSC® and EU Ecolabel certified. You can find some more details on Color Copy on the following microsite. Color Copy has been awarded the FSC® (Forest Stewardship Council®) certificate that guarantees well-managed forests. Color Copy has been certified with the EU Ecolabel. The EU eco-labelled products are less harmful in their impact on the environment than others. The EU Ecolabelis managed by the European Union. Color Copy is part of the Mondi Green Range family which consists entirely of FSC® or PEFC™ certified paper from well-managed forests, TCF paper or 100% recycled paper in our top quality segment. Color Copy has the ISO 9706 ageing resistance certification. This guarantees an archival life of >200 years. Color Copy has CO2 neutral certification. Presentations; direct mailings; business plans, business cards; proofs; manuals, etc.